so who delivers your tv programming? do you use a cable or satellite company? if so, which one, and how do you like them? i've been happy with just an antennae most of the time. there are a few shows i miss, but most of them are available on netflix or hulu, so no biggie. my biggest issue has been with the occasional bad reception when there is a storm. we live a little further from the tv towers than is recommended, and we have huge trees blocking the sky, so when the wind whips up, it gets spotty. but now that i have a roku box and ustvnow, i can stream those channels through wifi in the event of a storm. i'll see how well that works shortly, there's a storm brewing outside right now. Direct for me. Although it may be available to me now, cable stopped just down the street before. I've been with DTV for about 15 years and though it is expensive, it works quite well. Living in a fringe area of my state makes standard over the air viewing a hit or miss challenge at best. I had Direct TV for several years. Then, the TV, (along with most of the REST of my furniture :cheesy:) went away. Cuz's Mom got a new TV and needed my truck to pick it up, and help get it in the house. So, she gave me her old TV. Still worked fine, she just wanted a bigger one with a better picture to be able to see it better. I hooked it up to my cable from the internet, and it seems that in the several months since I had done that, cable blocked the TV programing, so I only got WSB Superstation on it. Plan B. I had made my own HDTV antennas back when the switch came, so that during heavy rains/storms, I could watch the weather for warnings and such. They worked every well, but over time, the connections would corrode slightly, and reception would decrease. So, this time, I looked and found another DIY antenna that was actually much simpler to build, and works even better. As of right now, I think I get 3 channels from our ABC station, 3 from the NBC station, 4 video + 1 audio from our local PBS station, 4 from our CBS station, 2 from Fox, and several misc. channels from 2 different religious broadcasters in the area. Those and the ABC station are the only ones really "local" and should be the only ones I would be able to get, without some "wowwy zowwy" (read PRICEY) professionally built antenna at full flaming retail. The CBS station is about 60 miles away (50 or so as the crow flies I guess) in Missouri, and the NBC station is probably a little farther than that, in Kentucky. I have to move the antenna a little to get a consistent signal from the NBC station, but the others come in reasonably strong. We're having our own round of storms with hail and the possibilities of tornadoes today as well, and I just checked, and I'm getting the weakest one just fine. I didn't bother with reflectors on either of them. So far, the second one is working better, and is considerably easier and quicker to build. The only difference is I used copper wire I already had laying around rather than go buy a roll of aluminum wire. Aluminum MIGHT work better, but for no more than I watch TV, and for what, this works just fine. I don't own a TV lol saves $$ and decisions - I'd rather read books anyway. giggle and the house is peaceful! 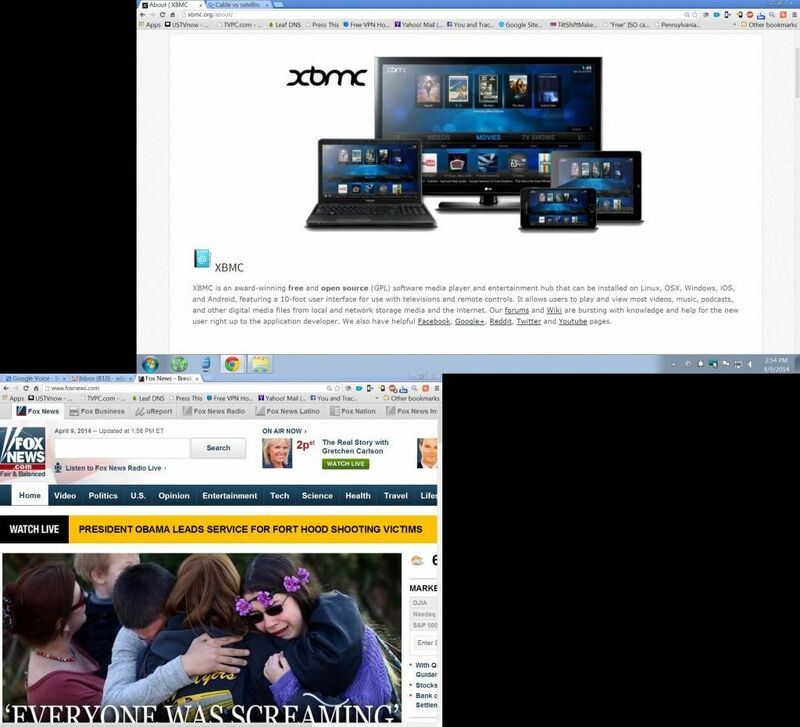 The video example above can be installed easily by downloading xbmc then going to my website and downloading a .zip file and replacing a folder with it on your machine in windows. Super easy and better than any other TV available anywhere. i've been cable free as well. but when my logitech revue box (aka the google box) quit working two weeks ago, i went and bought a roku. you may wonder why i would do that since i could easily hook up my laptop to the tv and do just as you've done, gotitgood.... but the truth is, i'm selfish. when mark wants the tv for sports or documentaries or whatever, I WANT MY LAPTOP! not that i don't enjoy a good documentary, but not all the time. and on mark's days off, he likes to turn on the documentaries and sleep through them. all day. so i bought a roku. i can get a lot more channels now, but to my knowledge, the xbmc that you're talking about won't work on a roku. i do get a lot of channels with my new device that i didn't have before, but most of them don't stream live... they have a relatively limited selection of shows available for streaming unless you have a password for their live content... that of course requires a paid service, and that's out of the question. still though, between that and my antennae, we don't run out of things to watch. Can't root ROKU anymore to install XBMC- BUMMER! The first time i saw Joan Osborne doing a rendition of a Motown song, it was an instant love connection. The outlaw county singers never get old. Steve Earl, Waylon Jennings, and Merle Haggard are my favorite country singers. I remember my teenage friends used to tease me endlessly. Since I got married, a switch flipped somehow. I got turned on to grunge/alternate R&R and alt Christian rock and never looked back. I think rock from the 80's really sucked, except a few hair bands like Cinderella and Quiet Riot, maybe the Red Hot Chillies. They're only a handful of songs I like from that decade. oh i do love waylon and merle! and i enjoy christian rock. i loved 80's music though. as for the hair bands, i liked their ballads, but could do without the metal. but mahdeen, what do you use for television? do you use cable, satellite, or stream from the internet? you did? hmmm. split personality kc? It's the weirdest thing I have seen in a long time. mahdeen copied and pasted my post here for some reason. Now I look like a darn fool. No cable/satellite/antenna for us. We do have a tv & 40 or so dvds - mostly box set & documentary. TV just isn't a big deal in our house & when it is on it's largely used for background noise.